currently snowing. We hosted a potluck with our friends who had hosted us, and everyone has stunned me with their generosity. I must say that this is a great group of friends, and while I’m excited to be finally on our way to something new, I am a bit sad to leave such wonderful people. 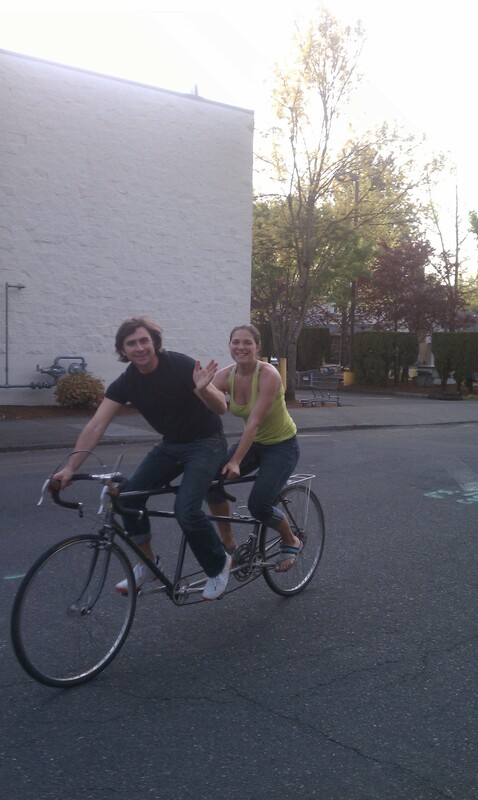 During our last week in Portland without our bikes, our friend John Benenate provided us with a tandem to borrow. Even friends who couldn’t make it to say goodbye gave us donations so we could replace our stolen bikes sooner than ever. We are well on our way to doing that, thanks mostly to Dallas’s friends and family! We will be spending the remainder of our weekend in Juneau before boarding a ferry on Monday morning for Skagway. Hopefully the weather will warm up rapidly so we can enjoy the last frontier! Posted on 27 April 2013, in Alaska, The space between and tagged Alaska, Portland. Bookmark the permalink. Leave a comment.